The Dons return to league duty this Sunday for the opening game of the 2018/19 Ladbrokes Premiership campaign. 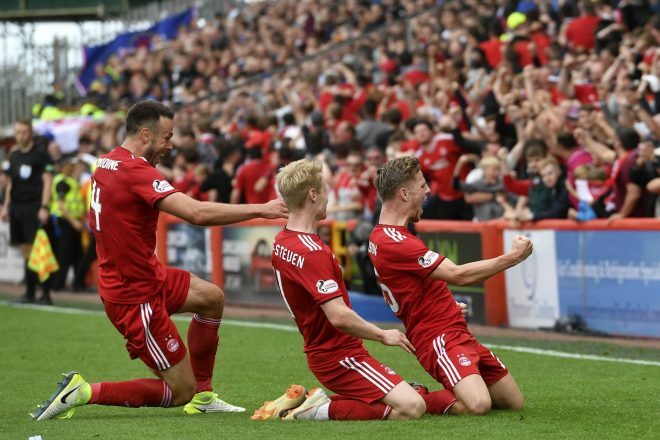 After coming so close to knocking out English Premier League side Burnley in the Europa League, Aberdeen will be looking for a reaction and there’s few bigger games to play than facing Rangers at Pittodrie. It will be another big turnout from the Red Army as they look to cheer the team onto an opening day victory. Rangers were able to edge through to the Europa League Third Qualifying Round on Thursday and will have freshness about their side following the appointment of former Liverpool captain, Steven Gerrard as manager in May. Last season it came down to the last day to determine the race for second place and The Dons pipped Sunday’s opponents to the post after a 1-0 win at Celtic Park. Dons boss, Derek McInnes spoke to the media following the defeat at Turf Moor and insisted the focus now switches to Rangers. “There’s no better game to try and get off to feeling better about ourselves than by winning on Sunday against Rangers. That’ll be tough but it’s a brilliant game to be involved and maybe just the perfect game to be honest after tonight. The first encounter between the sides came at Ibrox in November with The Dons looking to extend their lead over the hosts. The teams were meeting twice in the space of a four days and two wins would have put The Dons well clear of Rangers. 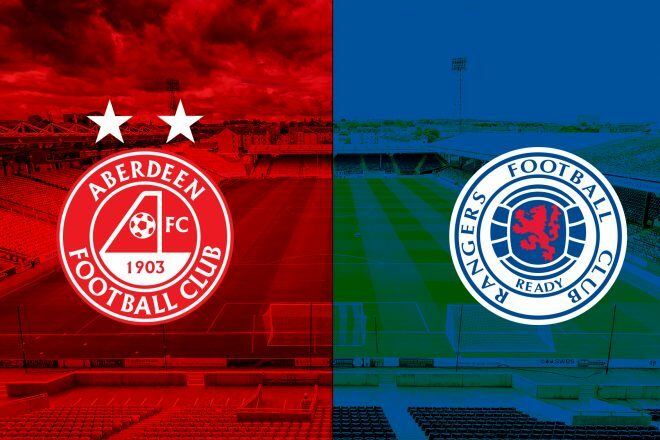 Unfortunately, the visit to Ibrox did not bring out the best of Aberdeen and were undone by a Gers side who had saved their best performance of the season for that night. On the Sunday Rangers travelled north knowing a win would draw them level on points with Aberdeen. It was a different game entirely as The Dons showed more appetite than the previous match. The visitors were able to get a goal in the first half and sit back. Despite former Aberdeen captain, Ryan Jack be given his marching orders The Dons were hit on the break and Rangers were in total control. Frank Ross gave hope to the home fans with a brilliant free kick, his first goal for the club, but Rangers held out to make it two wins in a week against Aberdeen. Another midweek trip to Ibrox came at the end of January and The Dons were much improved, but once again fell short going down 2-0. The biggest concern leaving Govan was the injury sustained to Aberdeen number 1, Joe Lewis who would spend the next two months out of action. On the penultimate day of the campaign Rangers visited Pittodrie knowing the winner would be in pole position to finish second and qualify for Europe. Aberdeen came out the traps early and could have been two or three up and Kenny McLean, on his last appearance for the club slammed home from the spot. Rangers went on to equalise and a draw was probably fair on the night. Despite enduring a tough time against the Glasgow side over the season it was Aberdeen that were able to win the race for second after a fantastic display at Celtic Park on the final day. If you can’t make the game on Sunday then RedTV, along with former Don Stuart Duff, will have live audio commentary from 12.45pm ahead of kick off. International subscribers will be able to tune in at this time. Post-match we will have reaction, highlights and a full match replay. A last minute goal from debutant Bruce Anderson earns The Dons a point on opening day. Two changes were made to the side that lost out to Burnley in extra time on Thursday. Shay Logan missed out – serving the first of his three-game suspension after picking up a red card in the 1-0 victory over Celtic in the last game of the 2017/18 season. Tommie Hoban also missed out after picking up an injury in the Europa League qualifier. Stephen Gleeson and Dom Ball were the men picked to replace them. The first five minutes were frantic as you would expect, but it was the visitors who made the better start. Jamie Murphy used his pace to beat the offside trap and find himself through on goal -latching onto a ball over the top from former Brighton teammate Connor Goldson. Joe Lewis did well to stand up and make the save as the red shirts scampered back. The danger wasn’t over yet and Scott Arfield should’ve done better with his effort in the second phase of play after Jack found him with a neat pass. After 11 minutes Rangers were reduced to 10 men in dramatic circumstances. Alfredo Morelos was given his marching orders after a coming together with Scott McKenna off the ball. The Rangers striker appeared to aim a kick at McKenna which was spotted by officials Kevin Clancy with the help of his linesman Graeme Stuart and Morelos had to walk. The red card heated up what was and always is a feisty encounter. The Dons clearly got a lift and began to come back into the game enjoying more of the ball in the middle of the park. Aberdeen couldn’t make the possession count and failed to create any clear-cut chances despite the numerical advantage. The visitors managed to weather the initial storm and got themselves back into the game. Just before the half hour mark, Dominic Ball was penalised for a pulling back Josh Windass in the in the box. Referee Clancy showed no hesitation in pointing to the spot. James Tavernier confidently tucked the penalty into the bottom left-hand corner past the outstretched arm of Lewis to give Rangers the lead. It was a double blow for The Dons as in the same phase of play Scott McKenna went down holding his hamstring and was forced to come off, forcing McInnes into a reshuffle. Forrester was brought on into midfield with Shinnie dropping back to left-back and Considine moving inside into the centre-half role. Just before the break, The Dons began to put some pressure on Allan McGregor’s goal. After some patient build up The Dons began to press Rangers back into their own half. McGinn put a dangerous ball in towards Cosgrove and forced McGregor into tipping the ball out for a corner. Cosgrove got on the end of the resulting set-piece but failed to direct his header on target and the ball comfortably sailed over the bar. It was better fromThe Dons, but wasteful and they went into half time a goal down with it all to do in the second half. No changes were made by either side at half time with The Dons shooting towards the Merkland end. Gleeson’s game was up after 50 minutes, McInnes looking to Stevie May who joined Cosgrove on up front in what looked like a 3-5-2 formation. The Dons were throwing red shirts forward in search for an equaliser but were finding it difficult to break down the visitors defence who looked threatening on the break. The game was stretched and on a number of occasions Aberdeen’s defence was being beaten by a simple long ball over the top. At the breakdown Rangers were taking any opportunity they could to slow the game down and eat up the minutes on the clock, frustrating both the home fans and players alike. Forrester became the first Aberdeen player to go into Clancy’s book for a body check on Coulibaly. Devlin went close for The Dons as the clock ticked into the final quarter. The centre half did well to meet McGinn’s corner but couldn’t divert his header on target. McInnes threw on Bruce Anderson for his Dons debut in place of Cosgrove for the final 20 minutes. Moments later there was a yellow card for Arfield and Devlin after a scuffle. Anderson was involved early on and did well to get on Dominic Ball’s cross. Much like the rest of the game his glancing header was off target and failed to trouble McGregor in goal. Anderson certainly was getting himself involved and he did well to draw another foul and a yellow card from centre-half Goldson – who was living dangerously going into the final ten minutes. Stevie May clattered Ryan Jack in an aerial challenge in which Jack came off second best. The former Don couldn’t recover from the challenge and was replaced by Liverpool loanee Ovie Ejaria. Ferguson went close again for Aberdeen with just five minutes left to play. His effort was yet again wide after Devlin had done well to nod the ball back into the danger area. It looked as though it wasn’t going to be their day. The fourth official added six minutes which gave The Dons a lift to raise one final push. And with four minutes left to play Bruce Anderson sent Pittodrie wild with a goal on his debut. Andy Considine got up well at the back post to nod the ball into the path of the young striker. Anderson swiped his left foot at it and directed into the bottom right corner past McGregor. It was a fabulous finish from the 19-year-old year which capped a fine individual performance and dream debut. The strike saved the day for The Dons, stealing a point with what was their first and only shot on target all game.